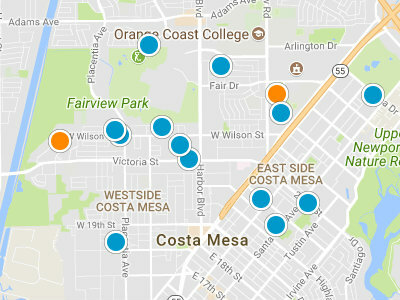 Mesa Bluff Highlands is residential neighborhood in the Southwest—Westside area of Costa Mesa. Mesa Bluff Highlands is a single family home neighborhood, built between 1961 and 1962. Homes in this community range in square footage from 1,500 square feet to 1,700 square feet. Homes are single level in this area and have been remodeled and updated. This neighborhood is known for their large yards, both front and rear yards. Due to the high bluff setting of this neighborhood, residents enjoy views of the Pacific Ocean, white water and breathtaking sunsets. The home prices in Mesa Bluff Highlands are between 615,000 dollars and 800,000 dollars. Residents are just a short bike ride away from the beach. Mesa Bluff Highlands is also very close to a large variety of shopping options, such as the Triangle Square Shopping Mall and many local freeways, especially the 55 Freeway.